Have I told you about our backyard pasture? Well, technically, it's not ours, but the tiny yard we do have backs up to a mule pasture. I love to draw the curtains and let the every now and then Portland sunshine stream into our happy kitchen. . . I can't explain the happiness I experience when I look out back and see "our mules". They come up next to the gate; we've even fed them apples. I delight in their daily habits--when they whinny and hee-haw like donkeys, when they gallop in a pack (there are 5 of them), when they trot back and forth, back and forth, when they curl up on the ground for some warmth. Tonight, on Valentine's day night, we got home and as we walked up to the front door, I heard the croaking chorus of frogs out in the pasture. Just like the country. Of course, the 2-4 frogs that seem to live under our house and inside our dryer vent aren't as thrilling, but the effect of far-off frogs was pleasing tonight. Simple things. Happy things. Frogs and mules. On Feb 2nd of last year, I'd had a pretty great day at work and came home to have dinner. I wanted to check on some insurance information and went to open a drawer when I felt the sensation of water coming from inside me. I was 14 weeks pregnant at the time--way too early for my water to break, way too early for labor, way too early for all my dreams of being "mommy" to be dashed. After calling the on-call doctor and being told it may not be too bad, to wait it out and call the doctor in the morning, and after trying to get in touch with my doctor all the next day for an ultra sound that would finally be scheduled two days later, I went to bed with the blessing Tyler gave me as my only source of peace. In the early hours of Feb 4th, I learned deeper meanings of the words loss, pain, numbness, cold, emergency room, toilet, placenta, baby, suffering, and anguish than I had yet to experience. Tears and screaming escaped without warning. Love and compassion poured down and out from my eternal Father, eternal companion, and my eternal family and friends. Grief is something you travel on your own. It doesn't matter who else "had a miscarriage" or "lost a loved one" when you are the one who is hurting. Sympathy is not needed and empathy does not exist, for each person's suffering is unique, save Christ only. How grateful I am that the Lord entrusted me with a little time to learn the honor of motherhood. How blessed I feel to have deeply personal experiences that assure me of life beyond the mortal grave no matter how awful and dark that grave may be. 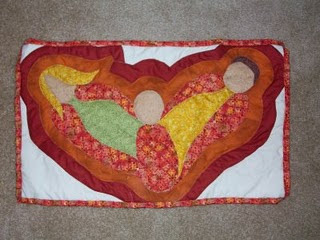 I made this quilt to symbolize the baby we never held in our arms, but now hold with our hearts. It was our miscarriage, never to be replicated, never to be forgotten.